Passamos pela Kaibab National Forest e entao chegamos ao Grand Canyon National Park - que para mim e um dos lugares mais impressionantes em que ja estive...Aqui a Natureza nos mostra a sua grandiosidade e se percebe o quao infimo somos diante dela!!! Seguimos para a cidade de Flagstaff onde pernoitamos no Flagstaff KOA. 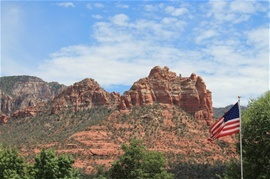 No dia seguinte passamos novamente pela cidade de Sedona que parece uma pintura natural - tal a beleza das montanhas dos mais diversos tons que a cercam. Aqui existe o "Museum of Movie Pictures" com mostra da maioria dos mais de 80 filmes feitos nesta regiao - na sua maioria westerns. Passamos por Phoenix - capital do Arizona - e seguimos ate Tucson onde pernoitamos no KOA Tucson - alias muito bom e organizado. No caminho se veem muitos saguaros - o cactus caracteristico desta regiao e que possui geralmente 5 "bracos" e estes so aparecem na sua totalidade depois de 15 anos. Nossa intencao era a de visitar novamente o "Old Tucson Studios" - neste local tambem foram filmados varios filmes e seriados como "Chaparral", mas eles fecham nesta epoca devido ao intenso calor. Assim que no dia seguinte seguimos para a cidade de Tombstone, a algumas milhas da divisa com o Mexico. Tombstone e o local onde aconteceu o famoso confronto do OK Corral - imortalizado em filmes - em 26 de outubro de 1881, entre os irmaos Earp (Virgil, Wyatt, Morgan) e Doc Holliday contra os Clanton e os McLaurys. Eles mantiveram o centro da cidade intacto e alguns predios permanecem como eram na epoca...como e o caso do Birdcage Theater. Almocamos no Crystal Palace Saloon e assistimos a encenacao do "tiroteio no OK Corral". Pernoitamos no Wellsfargo RV Park e um dos predios dentro do patio foi realmente da propria Wellsfargo. From Vegad we headed south passing by the Hoover Dam at Lake Mead - and this area is very beautiful. We went on to Kingman and Seligman on US 40 where it is possible to drive part of Route 66 and one goes through some unique towns. We went by the Kaibab National Forest and got to Grand Canyon National Park, which is, in my opinion, one of the most impressive places I have visited. Here Nature shows its grandeur and one can measure how small we are compared to the Mighty Nature!!! After visiting the park we drove to Flagstaff where we stayed overnight at a KOA Campground. The following day we crossed through the town of Sedona, which we have visited before, and this places looks like a natural artist's pallet...due to the beauty of the colorful mountains which surround the town. Here is the Museum of Movie Pictures, showing parts of the over 40 movie shootings that took place in this region(mostly westerns) because of the beauty of the place. We went by Phoenix and Tucson where we stayed overnight at KOA Tucson - very nice, clean and organized campground. On the way one sees many saguaros - which usually have 5 "arms" and it takes them around 15 years to come up with all 5 of them. Our intention was to visit Old Tucson Studios again - in this place several westerns and TV series were made - but we found out that they are closed at this time due to the high temperatures of summer. So, the next day we decided to visit the town of Tombstone. Tombstone is the place were the famous OK Corral Gunfight took place on October 26, 1881 between the Earp brothers - Wyatt, Virgil and Morgan, with the help of Doc Holliday; against the Clantons and McLawrys. They keep the downtown area intact and some of the buildings are even "unrestored" - like the Birdcage Theater. We had lunch at the Crystal Palace Saloon and watched a reenactment of the "shooting". We stayed camped at the Wells Fargo RV Park and one building inside of the park was actually one post of Wells Fargo.